In Senegal where rabies is endemic, human rabies is a notifiable disease. Between 1995 and 2016, 79 human cases were reported by the Fann University Hospital of Dakar . Although the annual reported number of human rabies cases is very low across the country [7–9], the number of individuals seeking PEP after suspected exposure to the virus has increased in the past years. Since 1963 in Senegal, the Pasteur Institute of Dakar is one of the major public rabies vaccination centres. 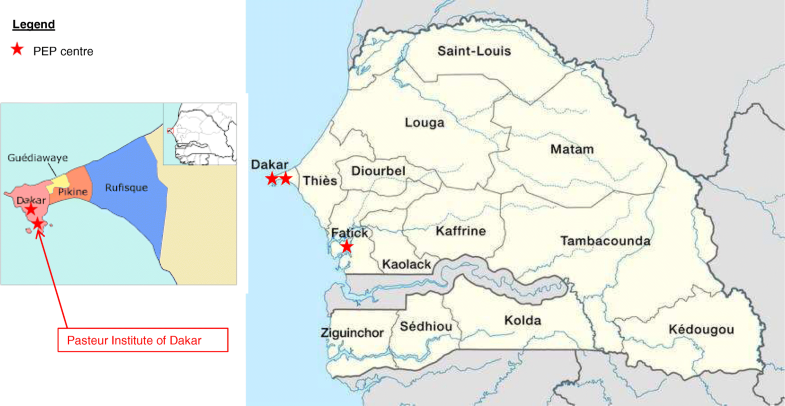 Despite the recent implementation of PEP in two other hospitals (the Fann University Hospital of Dakar in 2010 and the regional hospital of Fatick in July 2013), the Pasteur Institute of Dakar remains the most reliable data source to describe the use and administration of rabies PEP in Senegal (Fig. 1). 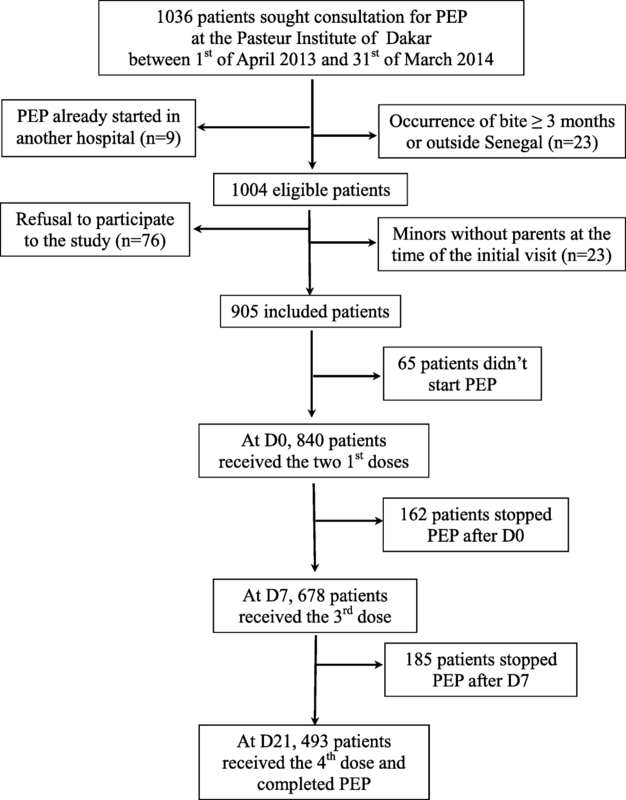 Thus at the Pasteur Institute of Dakar, from 2008 to 2012, between 850 and 1000 patients have received PEP annually, but very few data on PEP use are publicly available. Moreover, the discrepancies observed between the expected number of vaccine doses that should have been delivered if all patients who have been advised to start PEP were compliant, and the observed number of administered vaccine doses suggested that the implementation of PEP at the Pasteur Institute of Dakar was not optimal. This study confirms that the epidemiology of bite and treatment for suspected rabies exposures in Senegal is similar to what is observed in other African countries: children and young men are the most exposed , and dogs are the main reservoir [10–12]. Most of the animals involved were domesticated with identified owners, but only 4.3% of them were up-to date with rabies vaccination. The low vaccination coverage could be the result of a lack of regulations enforcement and controls for pet ownership in Senegal. Furthermore, the first reason highlighted by the patients who never started PEP or who were not compliant, was the high costs of the full PEP schedule. In Senegal, the costs of a full PEP schedule (excluding RIG) range from 40 to 60 euros, and according to the World Development Indicators, the average monthly disposable salary is around 160 euros . In addition to the direct expenditure on PEP, costs from travel to distant PEP centres and lost income whilst seeking PEP were already reported in studies conducted in other rabies endemic countries [21–23]. Therefore, the true costs of PEP has been estimated to be twice as high as those reported in Africa  and should be considered in economic costs of rabies, as high costs might led to poor compliance with PEP regimens and increased risk of death . The other main reason was the fact that the suspected animal was still alive at least 2 weeks after exposure, as reported by the patient and that the patient was informed by the Pasteur Institute of Dakar that PEP can be discontinued if, in the case of domestic dogs or cats, the animal remained healthy through a 2 weeks period of observation. With regards to this WHO recommendation, around 20% of the non-compliant patients of this study would have been considered as compliant. However, it was not possible to obtain a formal and well-documented assessment of the situation with a close follow-up of the health status of the animal after exposure because of absence of 10-day quarantine under the control of a veterinarian. In order to increase the adherence to PEP, a free of charge prophylaxis might be implemented as it has already been done in other countries where rabies is endemic [8, 34]. Moreover, intradermal regimens, successfully introduced in some endemic countries [22, 34–36], should be considered as they can reduce the cost by about 70%, compared to intramuscular regimens [37, 38]. Moreover, these intradermal regimens have been found to be equally immunogenic and as effective as the standard intramuscular regimens [33, 37, 39–41].